Mandrake is the common name of a number of plants in the Nightshade family, genus Mandragora. The roots often look like man or woman, or can be easily made to resemble them. The plant has been used in witchcraft for a long time. 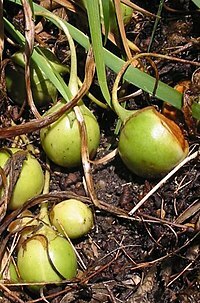 According to this literature, the plant shrieks in pain, when it is pulled from the ground. This shriek is able to make a person deaf. He might also lose his mind, or even be killed, if he is unprotected. Mandrake (Mandragora officinalis) has been used as an anaestethic for a long time. For this, it was usually prepared in an alcoholic solution.